During the last few months, iGEM Headquarters has been hard at work getting ready for iGEM 2017. We are excited to launch our new competition page and show you what we've been up to. iGEM is excited to announce the launch of the iGEM 2017 competition website! 2017.igem.org will be your resource for all competition related details and announcements. Check out the improved navigation menu, expand the menu items, and scan through the various pages. There is a wealth of information there all designed to help you succeed in the competition. iGEM is more than a competition. It is a program dedicated to education and the advancement of synthetic biology. The United Nations Biodiversity Conference gave iGEM the platform to participate in discussions about synthetic biology on a global scale. This past December Meagan Lizarazo, iGEM VP, made a statement in support of synthetic biology at the United Nations Biodiversity Conference in Cancun, Mexico. In addition to iGEM Headquarters, 5 iGEMers were selected to serve as official iGEM delegates at the event, joining in the conversation to address key issues surrounding policy and safety in synthetic biology on an international scale. We are proud to announce our Partner Sponsors Special Offers for iGEM 2017. 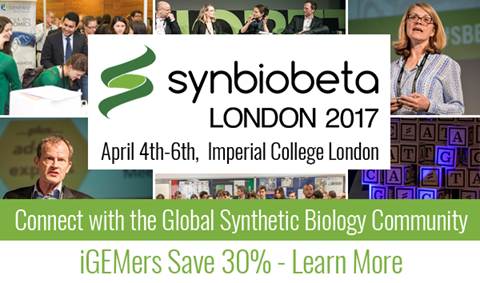 The SynBioBeta London 2017 conference is dedicated to joining thought leaders, entrepreneurs, and academia together to discuss the latest topics and advancements in the synthetic biology industry. A special discount offer is available for the iGEM network, save 30% off registration with code: IGEMSBBPARTNER. Mark your calendars and join us for the 2017 Giant Jamboree, taking place November 9-13, 2017, at the Hynes Convention Center in Boston, MA! Relive the iGEM 2016 Giant Jamboree. Visit the photo library or watch the wrap up video of event highlights found on iGEM 2016 Giant Jamboree page.